I'm warm in my coat. I don’t think I was going to post anything, but after arriving in HSV I figured I should would. It’s that time of year when things start to get a bit cold so I’ve broken out the ol’ winter coat. It’s a nice coat, a very nicecoat. 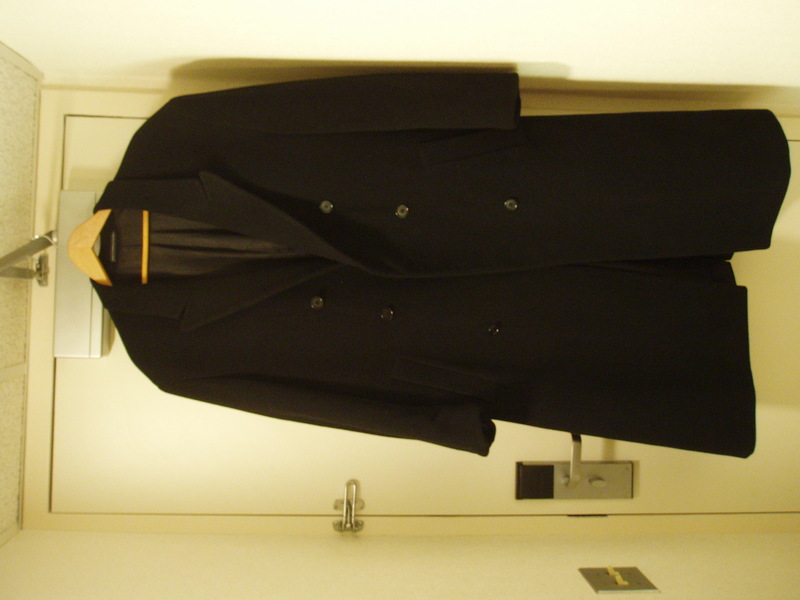 I first wore this black, wool, calf-length overcoat in February of ’08 when I went to Chicago to interview for a certain legacy carrier. This coat does bang-up job of keeping me warm when I can see my breath, and though it is neither company-issue nor compliant with our uniform standards I wear it to work (Company, give me a coat that 1) keeps me warm and 2) looks good and I will wear it). In addition to having this great coat, I have something else – namely a tendency to forget things that I’ve just remembered and told myself that I won’t forget again. As we’re deplaning in HSV I remember that I have I my have coat hanging in our coat closet on the plane. I think that I should probably take it out and put it on the crew bags that I’ve just gotten out, but then decide that I’ll remember it because I have to remember to get my food off ice. I do remember the food (you see where my priorities lie), but not the coat. My flying partner reminds me of my coat as we’re going down the escalator to the hotel. People are on board cleaning the plane, and I’m banging on the door trying to get down the jetbridge to retrieve my prized? coat. No one comes. I find the phone list and call the station manager; he’s apparently gone home (of course he has; it’s 10:30pm). I call the ticket counter, and the lady tells me she’ll be there in a bit after she finishes with a baggage issue. A few minutes later, instead of an airline employee coming to get my coat I’m assisted by the airport policeman. Thankfully, he actually does his job and thought it suspicious that someone would sit behind a gate counter and play on his phone when there were no flights going out. He gets on the radio, moves, shakes, and 15 minutes later I have my coat. I’ve pissed away almost an hour of a 13-hour layover, but luckily we stay in the airport hotel . . . in the airport. Whatever . . . I got my coat back and didn’t have to wake up at 6:30 to try and convince the crew that it was actually on the plane. Oh, and I meant for this to be a lot shorter. Why so many serviettes and cups? 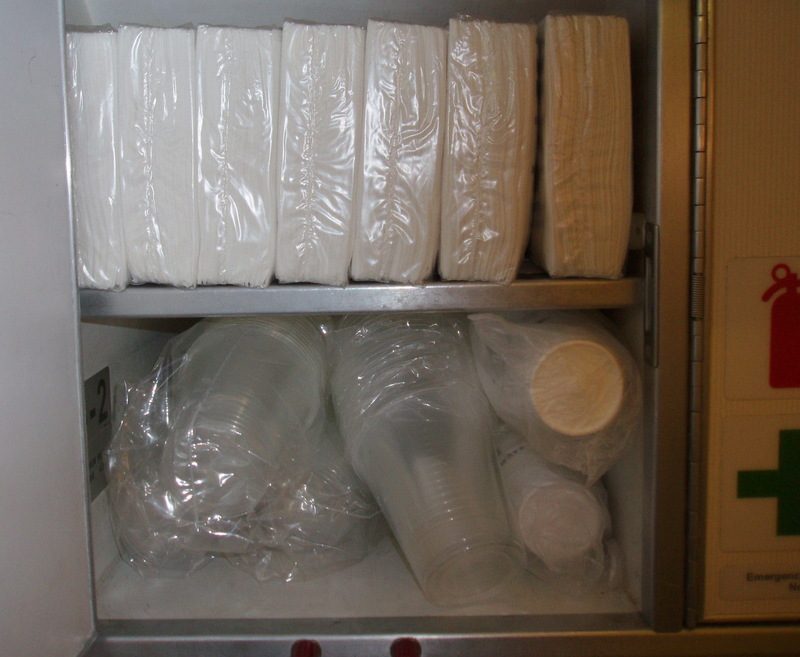 think those two white bags that we use to collect trash inflight should be enough to get you to Little Rock and back, so I won’t order any more of those, but you can never have enough trash can liners, so I’ll make sure you have enough to last through the Apocalypse…napkins, too. You can never have enough napkins so make sure the caterer brings you all eight packs of napkins. There’s only 50 in a pack; how do they expect us to perform a beverage service with so few? I mean, really. Look, I know the galley diagram says we only need to have 20 beers on board, but that’s just wrong. We must have at least 22; what if we sell out during the flight? Why? Why would you do this to me? Dear Lazy Flight Attendant, I have received the plane that you so kindly catered for me. I just have one suggestion, though. Next time, just order what you’re supposed to. We don’t have room on the plane for all the extra crap you request. This job’s not hard, and I know you know how to count because you have to tally up the number of passengers you “serve” before the plane leaves the gate. The Apocalypse is not close at hand; we don’t need 400 napkins or 18 trash bags for two flights lasting a combined three hours. Don’t make my job harder because you’re a lazy wretch and don’t want to think. Now that most major carriers charge to check a bag, passengers are carrying on a lot more than they have in the past, and on mainline this is causing all sorts of problems, from delaying boarding to running out of overhead space for all the flying passengers. One problem that we at the regional level have is people who try to bring bags on that don’t fit who then soil themselves when we tell them they can’t carry it on. 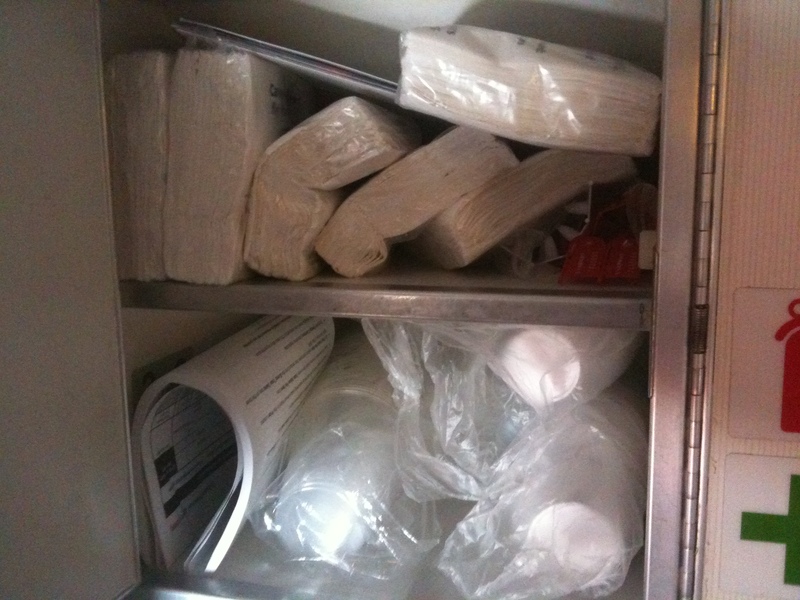 Since we fly RJs our overhead space is smaller, and bags that will fit on a B737 will not fit on our planes. Gate agents make an announcement detailing as much, but people don’t listen, and when I tell someone his rollaboard cannot come on he comes up with all sorts of excuses, the most common being, “It fit on my last plane,” not realizing that this is a different plane flown by a different airline with different policies. Leave it in the jetbridge, Tex. A lot of people play the I’m-kind-of-a-big-deal card and tell me they have important papers, a computer, and expensive who-gives-a-craps in their bags like theirs are more important, but in my and the company’s eyes, all bags are of the same importance regardless of the contents. If you’re worried about your stuff, take it out; I don’t care if you have to repack. I said leave it, Tex. One of the last two guys to give me trouble about his bag was going to XNA. 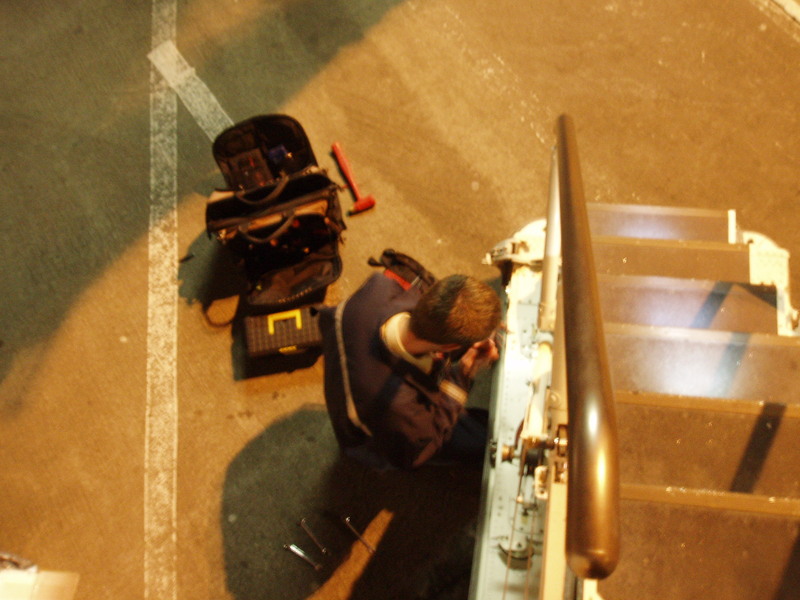 I stopped him before he stepped on the plane and asked him to leave his rollaboard in the jetbridge. He said he would have to repack it, and it would take so long, and he was a gold buyer carrying $100,000 in cash. He then asked me what I would do if I were carrying that much money, and I told him I wouldn’t be because I’m not stupid. Already having a bad day and not wanting to get into it with a pompous blowhard, I let him try his bag in the overhead; unfortunately it fit. My flying partner gave me a hard time because I let him walk over me and get his way when I should have just stood up to him and told him how it was going to be. She was bang on the money, and I vowed that the next time I faced this predicament I would not bend. Well that day has come and gone. I was in PHL, and the guy comes on with his big ol’ bag. I tell him it won’t fit, to leave it in the jetbridge, and he says he’ll have to repack. I say OK that’s fine, and he keeps walking down the aisle. I grab the handle and tell him again that it can’t come on, and he tries to tell me that he’s going to repack on the plane, probably sticking his old, wrinkly hind parts in the aisle completely stopping the boarding process. No, sir, you aren’t going to repack on here. What you’re going to do is take it off the plane and repack outside so we can board and leave on time. I’m not trying to be a jerk to the guy; I’m honestly trying to keep the boarding process moving so we can leave on time. We were running a little behind, and if someone is standing in the aisle trying to repack his bag, then we’re not going anywhere. If we had departed late, then I would have gotten a call from a manager asking why, and I would have had to tell them because a guy was holding up boarding trying to repack a bag. I would have then had to explain why he was repacking and then why I let him on with it. It rolls downhill, y’all. He gets back on sans bag, and I apologize for making him feel like I’ve purposely caused him undue stress. Apparently, though, he didn’t “want to hear it.” Too bad, Scooter; you heard every word I just said, so get over yourself. You may be a big deal at your local Elks Lodge, but not on my plane. p.s. Dear Reader, please know that I’m really not a jerk. 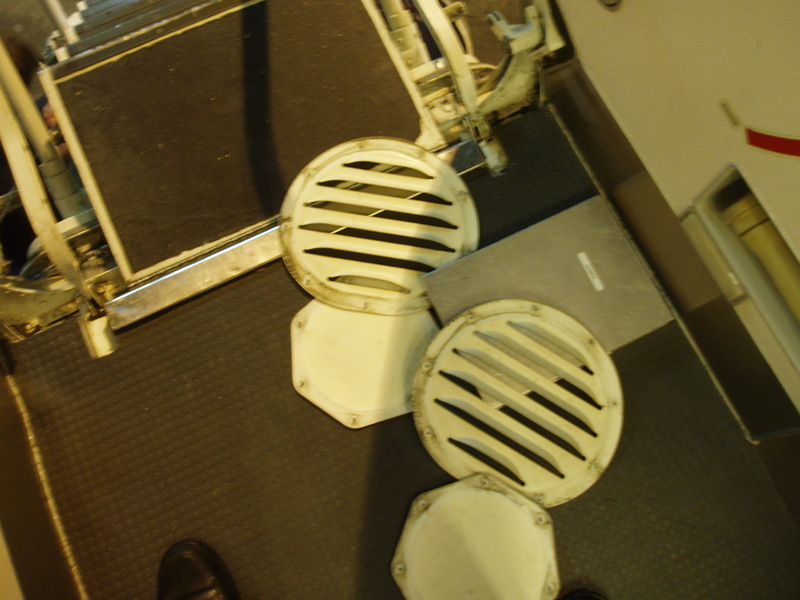 I try my hardest to make my flights a pleasant experience for the passengers…just don’t cop an attitude with me. I’ve finished day one of a four-day trip, and I’m working on the two hundo so I give that two very strong thumbs down. 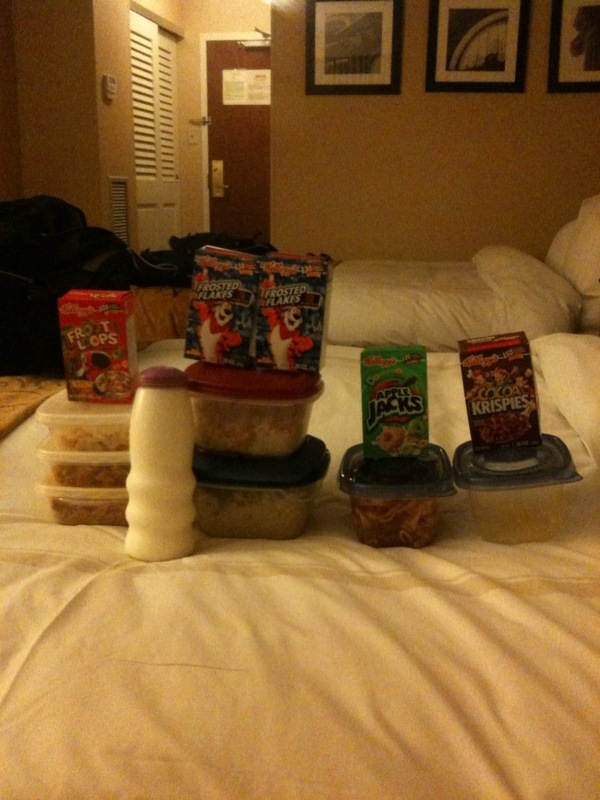 I’ve not been on a trip longer than two days in quite some time, and packing the food to last me through it all took rather a lot of effort. I got it done though. One of those containers is empty, and the penne with meat sauce was quite tasty. Tomorrow I’m in JAN, which brings me to the point of tonight’s post. One of the great perks of this job is getting paid to visit friends I don’t get to see nearly as often as I’d like. This time tomorrow I’ll probably be drinking my second beer with my great and wonderful friend Kristen whom I’ve not seen since the beginning of time. I met her in 2003 on a study abroad in Spain. Even though I don’t get to see or talk to her nearly as often as I’d like, when I do it’s like we pick up right where we left off – for me anyway – so I’m very much looking forward to some quality time with a quality girl and some quality brews. Now if only we could score some overnights in ATL…that’d be pretty boss. Short but sweet, I very much like Captain Dave’s opinion on this topic. I would say something on it, but then I’d be like a small child who wanders in to the middle of a movie; I’d have no frame of reference.